Apple is such a well-oiled machine that a rare misstep by one of the world’s most admired brands is front-page news. Consider Page 1 of the September 21 The Wall Street Journal: “Apple Makes a Wrong Turn as Users Blast Map Switch,” reports the WSJ breathlessly alongside an article about the U.S. presidential election and an analysis of the widely reported September 11 assault on the U.S. Libyan assembly. “Apple Makes a Wrong Turn” focuses on Apple’s decision to replace a Google Maps applications with an apparently less accurate Apple mapping software in the newest version of Apple’s OS operating software (iOS 6) for the iPhone. Yes, that’s right: a consumer uprising about mapping software on their iPhones receive the same level of attention as a discussion of a tragic assault that claimed lives and raises questions about U.S. security. Do our smartphones matter this much? Half of all Americans confess to sleeping next to our mobile phones. About 65 percent of people around the world would prefer taking their mobile phones over their lunches to work if forced to choose. Eight of out 10 people say they cannot go a single day without their mobile devices. Meantime, one of out 10 people studied by Stanford say admit to feeling “fully addicted” to their iPhones. 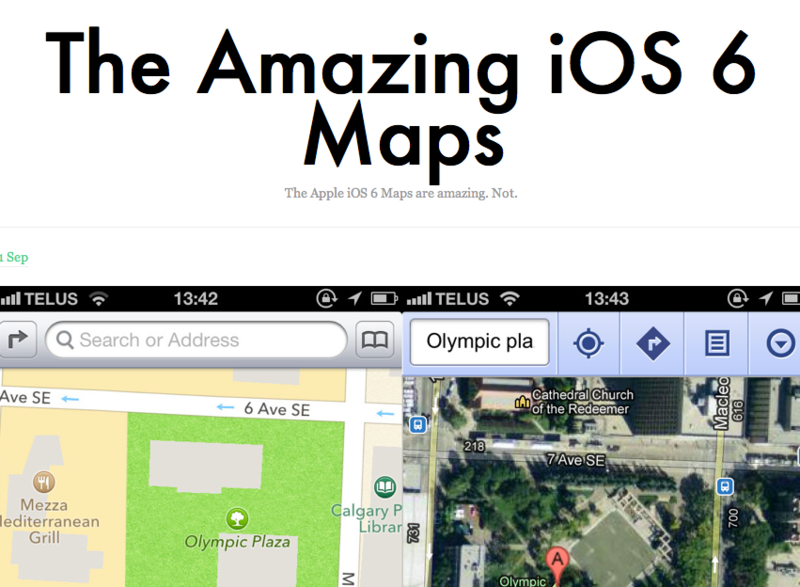 And evidently the overwhelming majority of iPhone users are emotionally dependent on Google Maps. 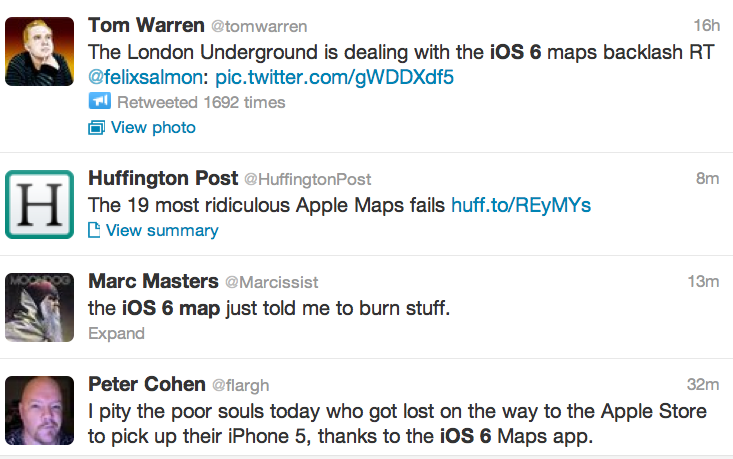 When it became known that Apple iOS 6 swapped Google Maps software with Apple’s own, a firestorm of protest erupted. A new blog, The Amazing iOS 6 Maps, shares numerous inaccuracies in Apple’s mapping software, such as the disappearance of Sweden’s second-largest city, Gothenburg, and wrong names applied to streets and landmarks. CNET and The Huffington Post joined the groundswell of consumer complaints erupting across social media, including people protesting on Twitter. To be sure, it’s important that consumers hold companies accountable for their mistakes, and it’s galling when powerful brands like Apple and Facebook foist changes upon us without first understanding what we want and need. But the Google Maps flap screams “First World Problem.” We buy our smartphones to enrich our lives, and instead our smartphones lead us around by our noses. Apple needs to fix inaccurate information in its mapping software, but meantime we might want to test another solution: ask a human being for directions. This entry was posted in Design, Digital, Marketing, Social media and tagged Apple, David Deal, Google Maps, iOS 6, iPhone, smartphone, Superhype, The Amazing iOS 6 Maps, The Wall Street Journal, Time. Bookmark the permalink. As a happy iPhone5 user for all of six hours or so (and loving it), I opened the maps app to discover that while everything around me seemed to be in place — and the 3D flyover is rather cool and fast — a park at the end of my street was misspelled. There is a rather easy fix – tap on the item (in this case the park name) and a bunch of options come up, one of which is \”report a problem,\” where one can enter new names or other info. Apple said today in a hasty press release that maps \”will work better the more people use it\” so we\’ll see if the correction is made… and how long it takes for that to happen. That aside, it\’s a gorgeous piece of tech. Thank you, John! It will be interesting to see how much spin-off business the new design generates for ancillary products like iPhone covers.